Last year’s Customer Service Week celebration at the Cooper Creek Event Center was a huge success. Organizer Jamie Marie Zamora summed the week up when she told us, "It truly was a celebration of the hard work each employee does! They felt appreciated and were reminded that their positive attitudes and kind acts do not go unnoticed!" The team celebrated every day, but Jamie says that Friday was the favorite. 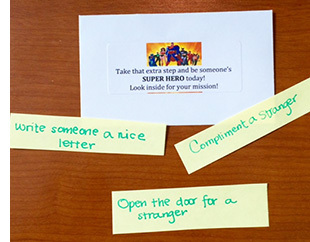 It was pay-it-forward day, a day to focus on the positive cycle of kindness. Each employee was given an envelope with a simple act to perform that day. Each person who received a kindness was also asked to "pay it forward" by repeating it or another act of kindness. The tasks were not complex says Jamie, and included everyday things such as: opening the door for a stranger, writing someone a nice letter, giving a stranger a compliment. And for one day during Customer Service Week, Cincinnati was a kinder place, thanks to the positive cycle Cooper Creek started. A creative teambuilding activity was the highlight of the breakfast celebration at RACO Industries. The activity was designed to encourage team members to learn a little bit more about each other. When they do, stories are shared, bonds are formed, and cooperation and teamwork soar. Manager Tracey Veith asked each person on her team to bring in one item from home. It had to be something that was meaningful to them but not easily identifiable as theirs. During breakfast at a local pancake house, all of the items were arranged at the center of the table. Throughout the meal reps took turns trying to guess who brought in each item. When all of the connections were made, each person shared a few words about their item and why it is important to them. 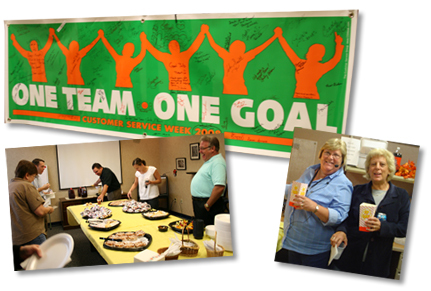 The team at Systems Services of America has been celebrating Customer Service Week for years. But each celebration is fresh, fun and creative. Last year it brought together individuals, departments, and even former staff. The service department celebrates on three out of the five days when everyone is on-hand to celebrate together. Day 1. The festivities start with a company wide kick-off breakfast. 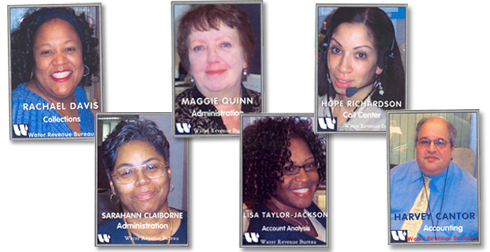 Everyone is included to "signify everyone’s role in customer service," says Bailey-Thompson. The service team also played a version of Jeopardy, with questions about the company. The prize for each correct question was a dress-down pass. Day 2. The highlight of the second day was a Ladder Ball competition. This team-building activity saw reps randomly assigned to teams and then asked to invite one person from outside of the department to join their team. There was also a special surprise when the entire operations crew arrived in the customer service department with gifts for the reps and inspiring words from the Director of Operations. Day 3. The final day’s activities focused on stress relief and included a catered lunch and visit from two reps who had left the department to have babies. The babies were referred to as the CSRs in training, says Bailey-Thompson. 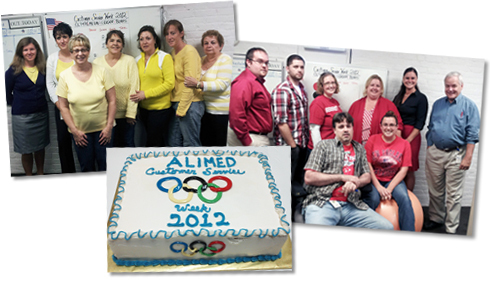 The team at AliMed celebrated Customer Service Week 2012 with an Olympic theme that focused on fun and some powerful messages. To begin, the entire department was divided into five cross-functional groups. Each group represented an Olympic ring and a core attribute of great customer service. Throughout the week, the Olympic Medal Leader Board showed each teams medal count. Winning teams received raffle tickets, and prizes were awarded at the end of the week. 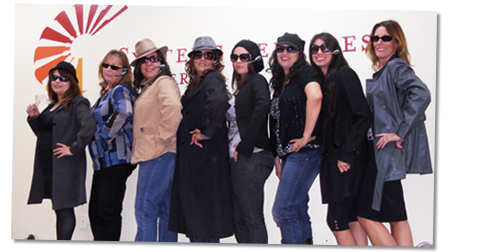 At Snap-on Diagnostics the customer care team celebrated with a different theme each day. And while here on the east coast the weather was definitely chilly, on the west coast they were able to enjoy a beach day at the office (the forecast called for a high of 90 degrees). There was also a pajama day, a sports jersey day, and more. The team also enjoyed sharing a catered lunch each day. To make this possible, managers from Sales & Marketing and Finance each hosted a lunch to thank the customer care team for their hard work throughout the year. Its a wonderful way to build strong bonds with other departments, to recognize frontline staff, and stretch the celebration budget. At Horizon Blue Cross and Blue Shield of New Jersey, the weeklong celebration focused on teambuilding. The first activity to bring people together was a special scavenger hunt. The instructions were to seek out supervisors and managers (excluding your own), introduce yourself and ask for their signature on your raffle ticket. The tickets were entered into a prize drawing for movie tickets or lunch with the department managers. Manager Dena Williams tells us that even the department s director got into the spirit and had people stopped her all over the building to request her signature. The second activity was the Star of the Day program. Stars were nominated by team members and supervisors. Each day a group of managers visited people who were nominated. They read the accolades from the nomination forms and distributed large paper stars. But the highlight of the presentation had to be when the managers broke into an original song, as they thanked reps for all they do each day. 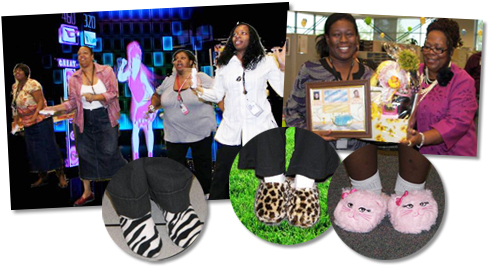 The theme for Customer Service Week 2011 was carefully woven into the daily activities at Snap-on, Inc.
Each day the Customer Care Team was invited to come to work in casual dress. Friday was reserved for super casual dress when shorts, sandals and sweats were allowed. 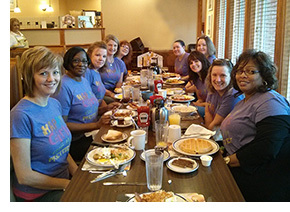 Staff members were Refreshed with daily breakfast or lunch breaks. And, because providing five meals can get expensive, the Sales and Marketing, and Finance Departments each stepped in to sponsor luncheons. Staff Recharged in a specially created relaxation and tranquility room. And they Reconnected with coworkers in the electronic game zone. Each year, the team at Health Plan of the Upper Ohio Valley finds an opportunity to take individual and group photos during Customer Service Week. The 2009 celebration included a Night at the Oscars party with dinner, goodie bags and more. The paparazzi were on hand to photograph each rep as she walked down the red carpet. Because there is only one man in the department, he individually escorted each woman and posed for a photo. 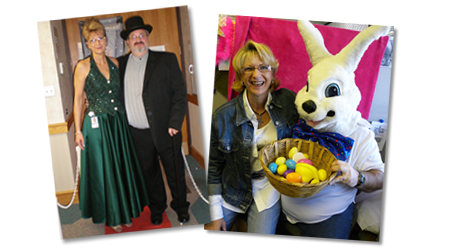 The following year, the team celebrated with a holiday theme and the lone male rep dressed as the Easter Bunny. He posed for photos with each rep and distributed plastic eggs filled with surprises after each photo was snapped. The photos are wonderful momentos of the celebration and are sure to bring a smile for years to come. If you dont have an opportunity to take team photos, consider distributing disposable cameras so that you are sure to capture the fun. The celebration at Approva Corporation in Virginia was designed to include everyone from local service staff to support staff over 8,000 miles away. To get everyone involved three different types of events were organized. Department-Wide. Each day, members of the service and support team received a small token of managements appreciation. By the end of the week everyone had a treasure chest of mementos from the week. The team was also treated to a thank-you lunch, which was hosted by the Senior Vice President of Global Customer Solutions. But the highlight was surely the desk-chair parade. Teams of service and support staff worked together to transform their chairs into festive floats for a parade through the department. Company-Wide. The entire company joined in a mid-week celebration with a giant cake and words of thanks and encouragement from the company CEO. World-Wide. Finally, the off-site service and support team in India celebrated Customer Service Week as well. They hosted their own parade with amazing costumes made entirely from paper. While the groups are over 8,000 miles apart, they bridged the distance by sharing photos of their celebrations. At the Memphis IRS Employee Resource Center, Customer Service Week is a time to show reps how much they are appreciated, celebrate milestones, recognize outstanding service, and connect with coworkers and former employees. How do they do all that in one week? Its a very busy week. Each day is celebrated with a different theme and then there are the major events like the gala Directors Luncheon on Thursday. While the management and leadership team serves lunch, the Directors Awards and the Length of Service Awards are presented. To make this event even more special, executives and former employees from near and far are invited to attend and share in the celebration. Another important event was incorporated into the celebration when the team received its 4 millionth customer call. Thats like one call from each person in the state of Oregon. Its an amazing milestone, which was celebrated by all, including a special gift for the lucky rep who took the call. Finally, to wrap up the festive week, a special video was created. It included highlights of the 2010 event as well as prior celebrations. To celebrate Customer Service Week, the team at Systems Services of America took a page from the classic television series Mission Impossible. While the theme music played on reps computers, each person selected an unmarked envelope with their mission... should they choose to accept it. Dressed in trench coats and dark glasses the team made their way through the building gathering important information. The goal was to learn about the many steps taken to ensure worker safety in the companys warehouse. The idea would work equally well to inform and educate staff about other departments. After all of the safety information was gathered, the staff met at a non-alcoholic cocktail party to celebrate the week and share their new-found information. Are you a Speedy Gonzales, Gumby or Martha Stewart? That was the question that reps at Cox Health were pondering during Customer Service Week 2009. The Physicians Billing team wrapped up its week-long celebration with a pot luck lunch and awards ceremony on Friday. Actually, there were two types of awards. First, were the Oscars, in which reps received recognition from management in categories such as Dedication to Accuracy and Offering Assistance. Speedy Gonzales: This person is a go-getter, he/she approaches issues with a sense of urgency, produces high-quality results, is persistent, and stays on top of things. Payton Manning: This person is a team player and is always willing to do whatever it takes to get the job done right. Gumby: This person represents flexibility. He/she is always willing to help a coworker, has excellent multi-tasking skills, and will assist in any area where there is a need. To create your own Peoples Choice Awards, view all eight of the categories used by Cox Health. A busy Customer Service Week at Mondial Assistance aims to help reps relax, keep fit and smile. But like many service organizations Mondial faces the challenges presented by a 24/7 center. Andrea Smith tells us that, Mondial always makes a strong effort to involve everyone in as many activities as possible. For example, Wednesday featured a company-wide lunch. Extra food was delivered and set aside for the overnight team so that they could enjoy a special lunch rather than leftovers. 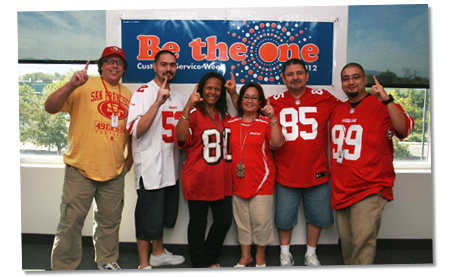 Later in the week, associates showed their team spirit by wearing their favorite team or sports wear to work. Prizes were awarded, but not until the following morning so that the overnight associates could also participate. Mondial also took the classic Smile Challenge and made it uniquely their own with a high-tech twist. 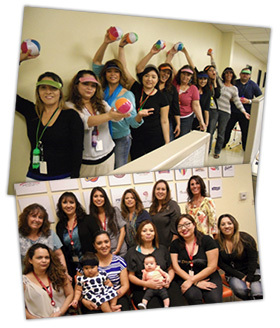 We took pictures of 36 associates in our office and posted their smiles on our company Intranet. Everyone really seemed to get into it, and one of our executives even brought in vampire fangs for her picture! says Andrea. Associates tried to match each smile to the correct person, which led to lots more smiles during the week and to three employees with perfect scores. Mondial also hosted a health and wellness fair during the week. As an emergency assistance company Mondial has a team of registered nurses on staff to organize such an event. But the real lesson from this activity is that a health fair was already planned. 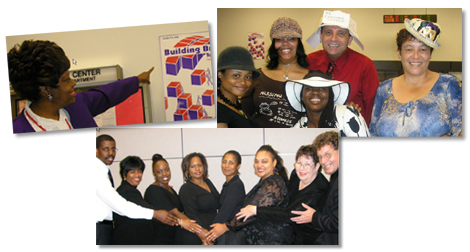 By working together, the Customer Service Week team was able to combine the two events. Customer Service Week is the perfect time to partner with your training, human resources and other departments to bring together many activities under the Customer Service Week banner. The team at Black & Decker/End User Services is in two locations. But a distance of roughly 600 miles didnt stand in the way of their celebrating together. 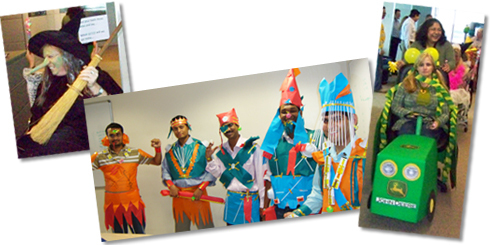 In fact, it led to some creative activities and brought the far-flung team closer together. 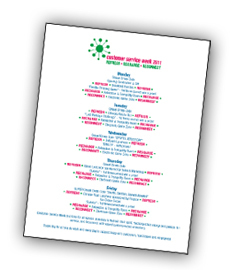 The first thing each office did was to sign a copy of the 2008 Customer Service Week poster and banner and send them to the other office to be displayed during the week. Next, the teams created care packages for each other. The team from Maryland sent their coworkers Goetz Caramels and Berger Cookies, two of their local specialties. While the team from Tennessee shared locally-made Pringles chips and pecan pies. Finally, they played poker together. Reps were assigned to teams of three with members from each location. On two consecutive days, each rep drew a card from a deck at his or her location. After sharing information with teammates and a little strategizing, each team presented their best five-card hand. In addition to these team-building activities, reps celebrated with a kick-off breakfast, catered lunch, popcorn break, Sundae bar, puzzles and games from the CSWeek.com website and more. Its true, the warmth of your smile really can be heard across the phone lines. So any Customer Service Week activity that reminds reps to smile is sure to be a success. At Mile High Foods, Manager Jeanne OBrien found a great way to focus on those wonderful smiles. Each customer service rep received a disposable camera and spent a week taking pictures of coworkers throughout the company. During Customer Service Week, those smiling faces were displayed in the lunchroom. Everyone was invited to vote for their favorite photo in categories such as Most Contagious Smile, Most Sincere Smile, Upside-down Smile, and more. Awards ranged from the appropriate wind-up chattering teeth to gift certificates. This easy to execute scavenger hunt at Stryker helped coworkers get to know each other while searching for common and unusual items. To encourage cooperation with other departments, managers from throughout the company were invited to team with customer service reps in this exciting hunt. Each team received a list of items that they had to collect. This included things such as a key chain with the company logo and a copy of the companys annual report along with some more difficult to find items including a hula hoop, an etch a sketch and a toilet tissue roll, which had to be decorated to look like a person. There was also a bonus item. The companys former CEO just happens to work in the same building (albeit for another company). The bonus item was a signed copy of one of his new business cards. A final added twist was the decorating contest. Each team received a sturdy box to hold their treasure. To qualify for an added gift, teams decorated their boxes. One box recreated a treasure chest and another was decorated as a pirate ship complete with a mast and a toilet-tissue person on watch. Off-site workers were included in this on-site Customer Service Week celebration through the clever use of technology. Dairyland Healthcare Solutions started their celebration early. Goodie bags with the weeks agenda, daily puzzles, a pen, and a small treat were distributed on the Friday before Customer Service Week. Then throughout the week, reps enjoyed a muffin morning, pie and ice cream social, a training seminar, and the return of the popular cube cram in which as many people as possible cram into one cubicle. This year the team beat their previous record of 21-1/2 with a total of 24 people. Just in case youre wondering about that half, one of the reps was pregnant last year. 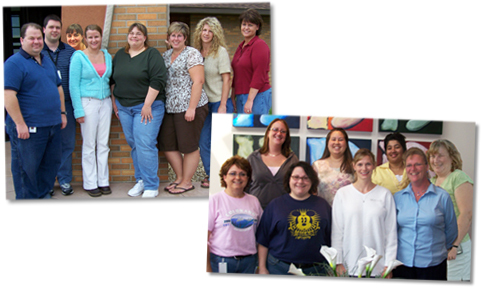 Finally, Dairyland created group photos of each of their customer service teams. Some teams include remote employees. To create the photos, one group photo was taken and then the heads of missing team members were added. Everyone received a copy of their complete team as a memento of the celebration. Can you spot the off-site workers? The team at Demag Cranes and Components Corp. celebrated with lots of events and activities every day of the week. Two of their activities focused on building strong connections with other departments. Throughout the week Demag posted slide shows on the company Intranet for everyone to enjoy. These included photos of the service team, information on Customer Service Week activities, and customer praise for frontline reps. One humorous slide show, pictured above, featured reps on the covers of popular gossip magazines. While other departments were learning more about the service team, the reps were learning more about their coworkers by participating in an amazing race activity. Loosely based on the popular television show The Amazing Race, the contest had teams of reps traveling around the office and interviewing people in other departments. The goal was to learn more about their work in order to solve the days challenge. 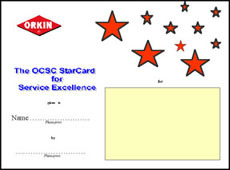 The celebration at Orkin was filled with a wide-range of activities but two that really captured the spirit of Customer Service Week focused on recognizing frontline reps for their hard work and commitment to service. The week began with a continental breakfast and motivational comments by the department vice president. Then everyone returned to their desks hoping to be Caught in the Act of delivering excellent service. This activity is based on what author Ken Blanchard calls the most powerful way to motivate employees: to catch them in the act of doing something right, and then cheer them on. Wednesday was Team Spirit and Peer Evaluation day. Teams dressed in their chosen colors. And participation was high because only those teams with 100% participation qualified for a team prize. The Customer Service Week agenda from the Philadelphia Water Revenue Bureau is absolutely packed with activities, but two stand out as truly unique. All week long, team members participated in activities such as treasure hunts, bingo, secret pals, daily quizzes, a pie-toss, and more. Reps were rewarded with Bureau Bucks which they used to bid on a wide range of items in the bureaus silent auction on Friday. Another highlight of the week was trading and collecting customer service All Star Trading Cards. Each trading card included a photograph of a team member on the front along with their All Star stats on the back. 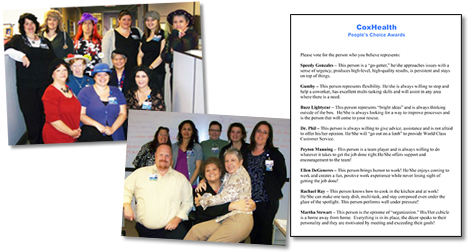 Prior to Customer Service Week, each employee had provided information about themselves along with their personal motto for the card. Finally, Phyllis tells us that the entire budget for this event for 250 people comes from the fund-raising efforts of the bureau. Beginning in January the bureau hosts two events per month. The events both raise funds and keep morale and team spirit high throughout the year. A candy sale, and more. A portion of the funds raised are also donated to a local emergency shelter. 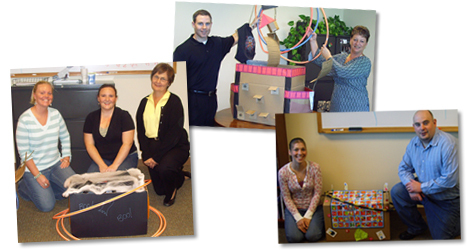 Games and contests are an important part of every Customer Service Week celebration. When we play together and laugh together, we build strong bonds, which last through the most stressful and difficult moments. One of the contests that has been a part of just about every Customer Service Week celebration is the baby picture match in which team members try to match coworkers to their baby pictures. Weve seen lots of variations on this theme but the folks at the James Madison University Computing HelpDesk, which provides support to JMU students, faculty, and staff, have come up with a fun new twist. 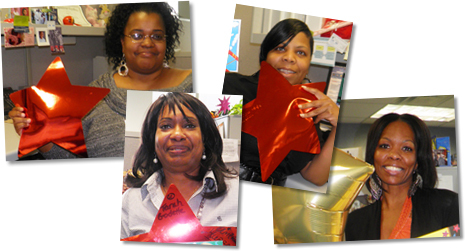 For several weeks leading up to Customer Service Week each frontline employees smile was photographed. 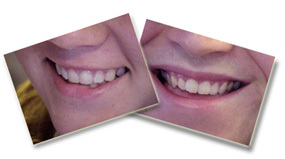 The photographs were posted during Customer Service Week and everyone tried to match the smile to its owner. What a great way to draw attention to the importance of smiling when we work with customers over the phone or in person. In a second contest, team members were asked to match each of their coworkers with one of the superlatives listed below. After the entries were tallied, each team member was presented with a prize and certificate recognizing their superlative. For organizations with far-flung customer service reps it can be difficult to celebrate together. ABE Services solved the problem with this fun activity, which involved weeks of planning and brought everyone together for a big surprise. ABE Services has staff at several branch locations and onsite at client locations. To involve everyone in the celebration, managers went undercover. During the weeks leading up to Customer Service Week, they "snuck" into each location and taped scratch-off lottery tickets to the bottom of each reps keyboard. At 10:00 a.m. when the email was delivered, staff at all locations were turning over their keyboards and sharing a special moment together. According to client services manager Jennifer Lauth, It was a big hit. And to top it all off, the person who won the largest prize in the scratch-off contest also received an additional prize from the company.